Looking for a snack after a busy morning of inspections? 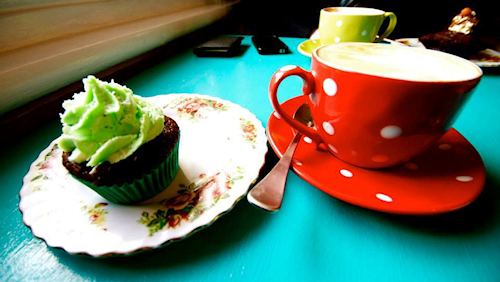 This week Street News enjoyed a sugary treat at Sugar Puff Cupcakes in Yarraville. There’s no denying Yarraville is one of Melbourne’s café hotspots. Venture out to the chic little suburb and you’ll never go without a hit of caffeine or somewhere to relax on a lazy Sunday afternoon. 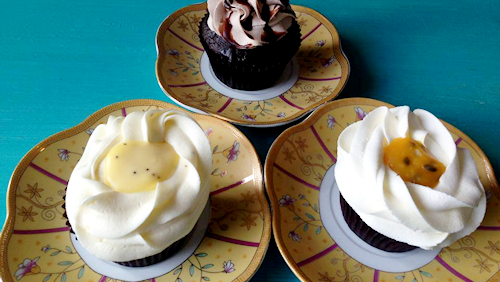 However, there’s a coffee shop hidden away in an old Victorian-style building that you might not even notice at first glance – Sugar Puff Cupcakes. When I saw the sign that read ‘coffee and cupcake for $5,’ I simply had to have a look. And it was a little like stepping inside my grandma’s kitschy lounge room – the interior was a mishmash of furniture, pastels and dainty clutter, much like cupcake topping itself. Though it’s cosy enough that they can only squeeze in a few tables, they don’t serve meals, so it’s not the kind of place you would go with a large group of people anyway. What they do serve is a variety of drinks and sugary sweets. Glass display cabinets show delicately decorated cupcakes of all colours and sizes. You can take your pick from pink vanilla and death by chocolate to peanut butter and Turkish delight. I was a little overwhelmed by choice, to say the least. While the gorgeously decorated sweets seem like they should be on display only (and certainly not sold so cheap), their insides are just as delectable as their outsides. The moist sponge cake is full of flavour, and the icing tastes so good you won’t even think about the calories. To complement their mouth-watering selection of sweets, the coffee is excellent. If you’re feeling fancy you can try one of their Gourmet Vienna blends, or the signature Gourmet Mocha. The owner definitely knows her market. Breakfast at Tiffany’s plays on top of an antique piano in the corner, while framed posters with peppy cupcake slogans cover the walls. ‘Stay calm and have a cupcake,’ and ‘You can’t buy happiness, but you can buy cupcakes and that’s kind of the same thing,’ were a few of my favourites. If you’re feeling like a coffee and something sweet, you can’t pass up Sugar Puff Cupcakes. It’s perfect place to relax, and its Alice in Wonderland-style atmosphere is sure to be a winner with the kids. Make sure you take advantage of their $5 coffee and cupcake deal.